– I have used the convention in applying Newton’s second law to make all forces, displacements, velocities and accelerations down the plane negative, and up the plane positive. The “parallel force” (F||) is just the component of gravity that is parallel to the plane. The Perpendicular force (Fperp) is the component of weight perpendicular to the plane. 1. A 2.15 kg block of wood is on a frictionless inclined plane that makes an angle of 35.0o with the horizontal. a) Find F||, and Fperp b) If the block is released on the plane, what will be its acceleration down the plane? c) What force in what direction would prevent it from accelerating down the plane? Fperp = (2.15)*9.8*cos(35) = 17.260N = 17.3 N but since there is no friction the Fperp is not terribly useful. so a = -5.621 m/s/s = -5.62 m/s/s (down the plane). 2. 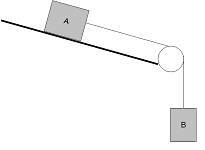 A 5.00 kg block of wood is on a frictionless 13 m long inclined plane that makes an angle of 47o with the horizontal. a) Find F||, and Fperp b) If the block is released on the plane, what will be its acceleration down the plane? c) What time will it take to slide down the plane if it is released at the top from rest? d) What force in what direction will make the block accelerate up the plane at 4.50 m/s/s? e) What force in what direction will make the block accelerate down the plane at 4.50 m/s/s? Fperp = (5.00)*9.8*cos(47) = 33.418N = 33 N again, not terribly useful. <-35.836 N> = (5.00 kg)a, so a = -7.167 m/s/s = -7.2 m/s/s (down the plane). <F – 35.836 N> = (5.00 kg)(-4.50 m/s/s) where the acceleration is negative because we are accelerating down the plane, and up the plane is positive. F = 13.336 N = +13 N. Since it is positive, it is up the plane. 3. A block of Spam is on a frictionless inclined plane that makes an angle of 35o with the horizontal. a) If the Spam is released on the plane, what will be its acceleration down the plane? If the Spam is given a velocity of 5.0 m/s up the plane, b) how far up the plane will the block slide before coming back down, and c) what time will it take for the block to come back down to where it was released? OK, we don’t know the mass of the Spam, but we do know that it is tasty, and also some kind of meat. Don’t let this bother you. (Not knowing the mass) The mass will cancel, or the problem is unsolvable, except in terms of m. Leave m in, and solve it that same way. Fperp =m*9.8*cos(35) = 8.028m again, not terribly useful as the plane is frictionless. <-5.621m> = ma, and m cancels from all terms, giving a = -5.621m/s/s = -5.6 m/s/s (down the plane) Pretty easy, huh? s = ?, u = +5.00 m/s, a = -5.621 m/s/s, v = 0 (when it reaches the top). t = ? 4. A thing is on a frictionless 3.2 m long inclined plane that makes an angle of 47o with the horizontal. a) If the thing is released on the plane, what will be its acceleration down the plane? b) What time will it take to slide down the plane if it is released at the top from rest? OK, again, we don’t know the mass of the thing, so let’s leave m in, and solve it that same way. Fperp =m*9.8*cos(35) = 6.684m again, not terribly useful as the plane is frictionless. s = -3.2, u = 0, a = -7.167 m/s/s, v = ?, t = ? a) If M1 has a mass of 23.1 kg, and M2 has a mass of 5.63 kg, what is the tension in the string, and the acceleration of the system? For problems with a string we need to set up two <F> = ma problems, and then solve they system of equations. a = 1.92239 (which is good – that’s what we got – we have definitely found the a and T that makes the system of equations work. b) If M1 has a mass of 2567 kg, and M2 has a mass of 1.00 kg, what is the tension in the string, and the acceleration of the system? c) If M1 has a mass of 1.00 kg, and M2 has a mass of 500. kg, what is the tension in the string, and the acceleration of the system? d) If M1 has a mass of 35.0 kg, what does M2 need to be so that the system has an acceleration of 3.15 m/s/s? a = (16.554 kg)(9.81 kg)/(16.554 kg + 35.0 kg) = 3.15 m/s/s – so I bet we’re right. e) Answer part a) but include a 17.2 N friction force on the block on the plane that resists the acceleration as it moves to the right. a = 1.3237 (which is good – that’s what we got – we have definitely found the a and T that makes the system of equations work. 6. The plane and pulley are frictionless. a) If A and B both have a mass of 5.0 kg, and the plane makes an angle of 25o with the horizontal, what is the acceleration and the tension in the cable? The difference between this problem and problem #5 is that there is a slant in A’s direction. In order to solve for the gravitational pull on A on a 25o slant, we use 9.81(sin(25o)). With that in mind, we can set up our system of equations. Once solved, we get a = 2.832 m/s/s = 2.8 m/s/s. We can then plug in our acceleration into either of the tension equations to solve for T.
b) Solve as in problem a), but give A a mass of 5.0 kg, and B a mass of 1.78 kg. Exact same procedure, but now we’ll use 1.78 kg in place of B’s mass. c) Suppose A has a mass of 4.51 kg, and accelerates from rest 3.27 m up the ramp in 1.81 seconds. What must the mass of B be? In order to solve this, we must first find the acceleration up the ramp that the 4.51 kg mass does. We can use SUVAT with the 3.27 m and the 1.81 s to find the acceleration. With our newfound acceleration, we can set up one of our tension equations to solve for T. Since we solved for the acceleration in A, and we also have the mass, the only variable we have left to solve for is T.
We can now plug the tension into the equation for B, finding mass. d) If the plane angle is 30o and A is 15 kg, what should the mass of B be to prevent acceleration? If our acceleration is 0, we can set up our equation for tension like this. 7. 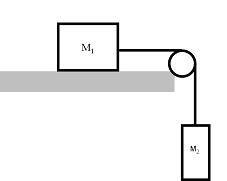 The plane and pulley are frictionless, and the plane makes an angle of 21.0o with horizontal. 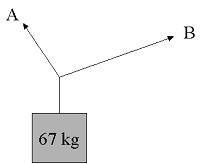 a) If A has a mass of 5.00 kg, and B 4.30 kg, what are the acceleration and the tension in the cable? Similar to 6, this scenario is the same idea with forces in the same direction because of the slope instead of the opposite. Because the forces are act in the same direction, the two (mg)s will be added together. b) If A has a mass of 3.12 kg, and the tension in the cable is 2.56 N, what must the mass of B be? We have enough given information to solve for the acceleration in the tension equation for A. With the uniform acceleration, we can solve for the mass of B. 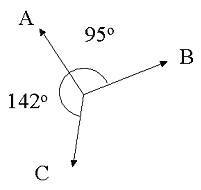 Cable A makes an angle of 63.0o with the horizontal, and B makes an angle of 23.0o with the horizontal. What is the tension in each cable for there to be no acceleration of the system? The first thing to do is convert both angles into trig angles. B’s angle is already a trig angle, since the angle it makes is with the 0o horizontal. A, however, makes a 63o angle with the 180o horizontal. In order to convert this into a trig angle, we take 180o – 63o = 117o. With our correct angles, we can set up a system of equations that we can solve with a matrix. Solving this will give you 606.4976 for A and 299.1229 for B. Cable A has a force of 23 N along it, what must be the tensions in cable C and B for there to be no acceleration of the system? As we did in the last problem, we will need to convert all angles to trig angles. However, there is no horizontal this time. Also, there is no gravity acting on anything, all forces are tensions in cables. With no gravity, there is no distinct place, and we can choose any cable to be our horizontal. For the sake of this problem being easy, we can use cable A as our horizontal, since we already have A’s force. Rotating to the system to make A be along 0o, B is 95 below 0o, making B = 360o – 95o = 265o. C is 142o, so its angle is 0o + 142o = 142o. With our newfound trig angles, we can set up a system of equations. We need each equation, again, to balance itself out to 0. Find the third force (the equilibrant) that would prevent the system from accelerating. With the x and y components, we can find the equilibrant’s angle magnitude. Tan-1(7.22/-8.42) = -40.61. However, since the x is negative and the y is positive, we know the angle has to be in quadrant II. Adding 180o to our answer will give us such an angle. 180 + -40.61 = 139.39o. *Note: If this concept is confusing, there is a drawing on problem 11 to help explain the same concept*. We can now find the magnitude using the Pythagorean Theorem. So, our angle magnitude for the missing angle is 11 N @ 139o. The answer comes to be 7.0 N @ 161o.